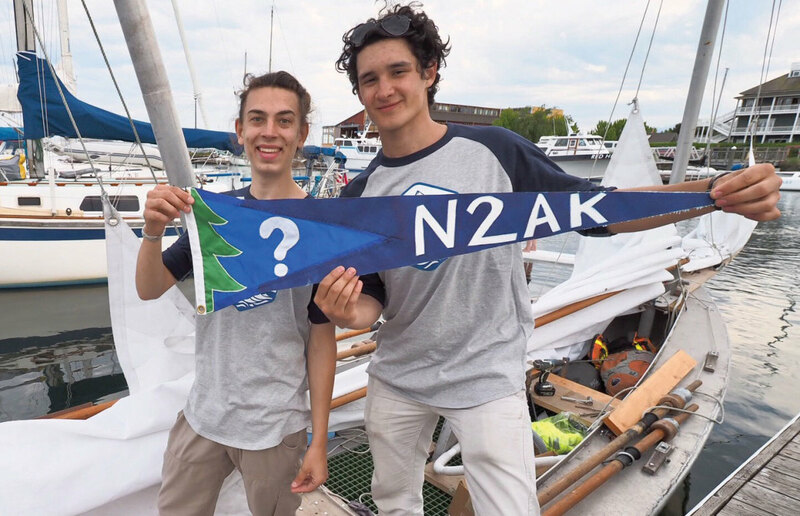 They called themselves North to Alaska (or N2AK) and were one of 64 entries in this year’s Race to Alaska (or R2AK), a 750-mile sufferfest that allows only wind and muscle power for propulsion. 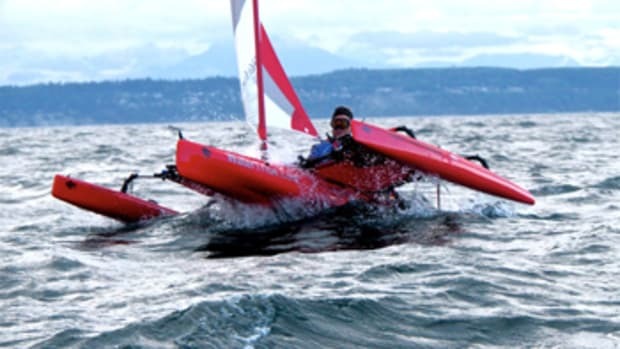 The race takes participants from Port Townsend, Washington, to Ketchikan, Alaska, with one official stopover in Victoria, British Columbia. 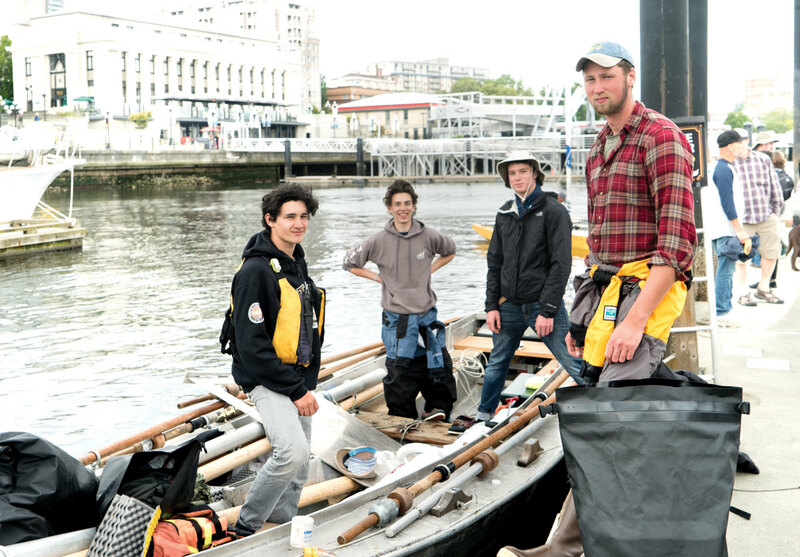 The N2AK crew (from left): Henry Veitenhans, Sean Westlund, River Yearian, and Malachi Church. 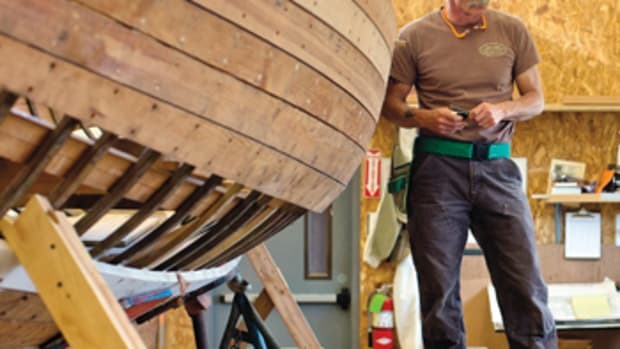 Cast in the role of Benjamin Button in this chautauqua was 63-year-old Greg Veitenhans, Henry’s dad and mentor, who went above and beyond parental duties by sailing with the young lads and welding the Johnny Horten, a 25-foot sharpie named for the country singer who popularized the song North to Alaska. 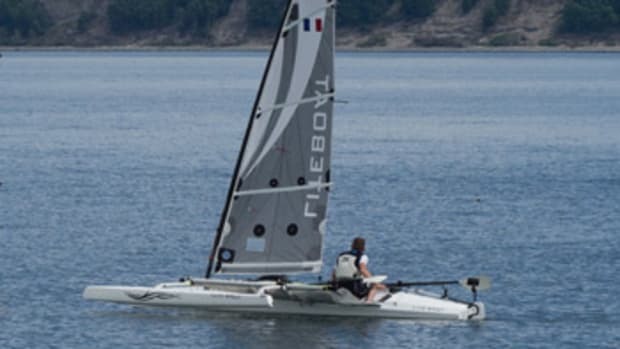 The welding was needed because, for weight considerations and simplicity, the elder Veitenhans used marine-grade aluminum instead of plywood and epoxy, as prescribed by the plans of small-boat guru Reuel Parker. The story of N2AK is one of the many odd yet expected episodes at this event, where the weird, strange and unusual fit just fine. 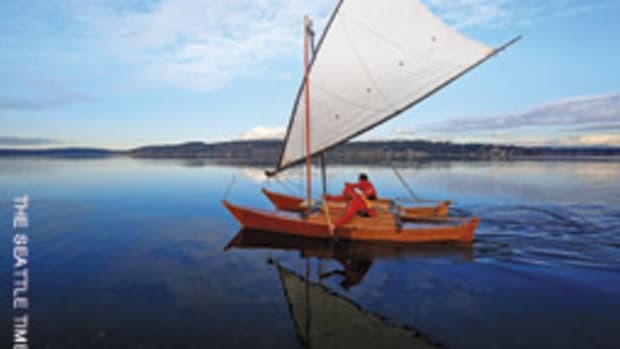 Three youngsters and an old fox racing a home-built open boat across the notorious Strait of Juan de Fuca, through current-ravaged Seymour Narrows and all the way up the wild Inside Passage was all but inevitable. Under the watchful eye of Ranger, Veitenhans (left) and Church apply some muscle on the way to Port Townsend. Henry kicked down the open door with his father. “It was our last best chance for a father-son adventure, I guess, and an opportunity to connect with my German ancestors who fished in this area on open boats,” Greg says. The Veitenhanses make their living by fishing commercially in the Gulf of Alaska. Sailors they are not, but they know these waters like their back pockets. “By doing this race, we’re just commuting to our jobs on the scenic route,” Henry says with a chuckle. He’s a leader — curious, outspoken and bright, and able to juggle whatever comes next. He’s also cut from a bolt of tough cloth. He and his younger brother Joseph have been part of the family’s offshore trips since they were toddlers. And before becoming teenagers, they worked the deck alongside their parents, earning the crew share, which was kept in escrow. With this ”fish money,” Henry bought a red 1984 Mercedes 380SL convertible that he proudly drives around his hometown. And justifiably so because that wad of cash came with pain attached. The first time he was stung in the face by jellyfish that came up with the catch, he gritted his teeth, swallowed his tears and held his station. 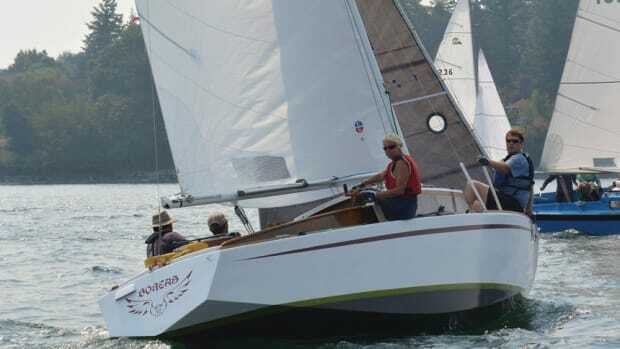 The day before the start, the silvery Johnny Horten peacefully tugged at her lines in Mystery Bay. Greg, on his back on the dock, was drilling holes to attach a solar panel on the stern. The boat might be short on Gucci — $10,000 was the total expedition budget — but it’s long on practical features, including four rowing stations, waterproof flotation and stowage compartments, and grates instead of a fixed sole. Not to mention the two unstayed and sharply raked masts that are reminiscent of those aboard the famous schooner America. They’re made from cut fir trees and aluminum sleeves so they can be unstepped in a flash when conditions warrant. Henry Veitenhans assembled a team with a mix of strength, talent and personality. 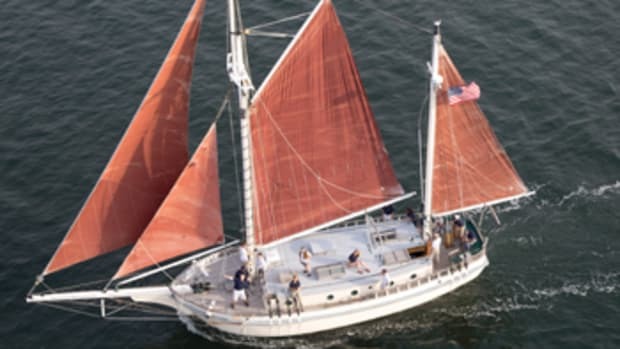 The sprit sails, also homemade, with help from local sailmaker Najah Chimenti, ride up and down on mast hoops cut from gray PVC pipe. Sheets and control lines look as if they were fashioned from repurposed crab trap line. New, laminated plastic Tufnol blocks are just about the only yachty touch in sight, but the boys adore all of it. “I like her lines and that we had to put her together from scratch,” Westlund says. Assembling a team was Henry’s task. It was his senior project in school, and it had to be community-based and relate to the maritime environment. Looking for the right mix of strength, talent and personality, he recruited classmate Yearian. “River was perfect. He’s strong but hadn’t done anything like this before,” Henry says. 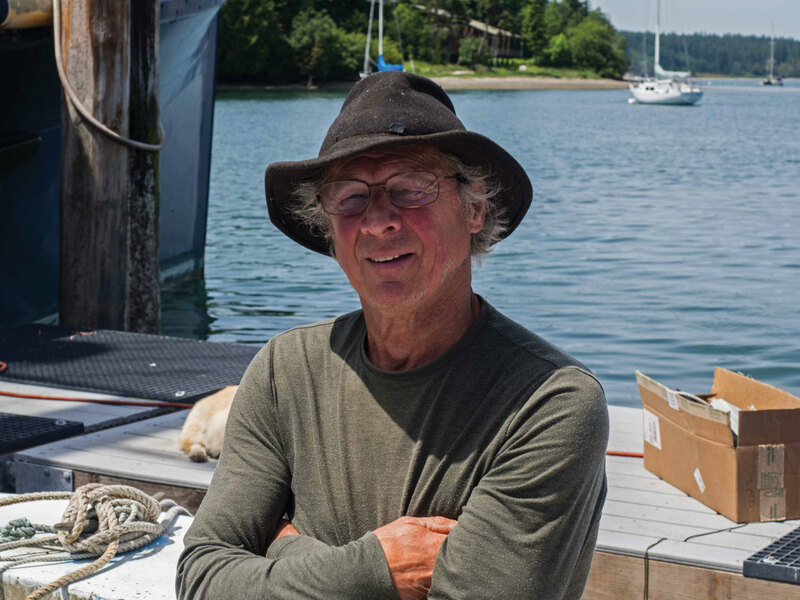 Then he added Westlund, who brought valuable experience as a former skipper of the high school sailing team, and Church, who lives aboard his own boat in Seattle, where he works on tugs and other commercial vessels. 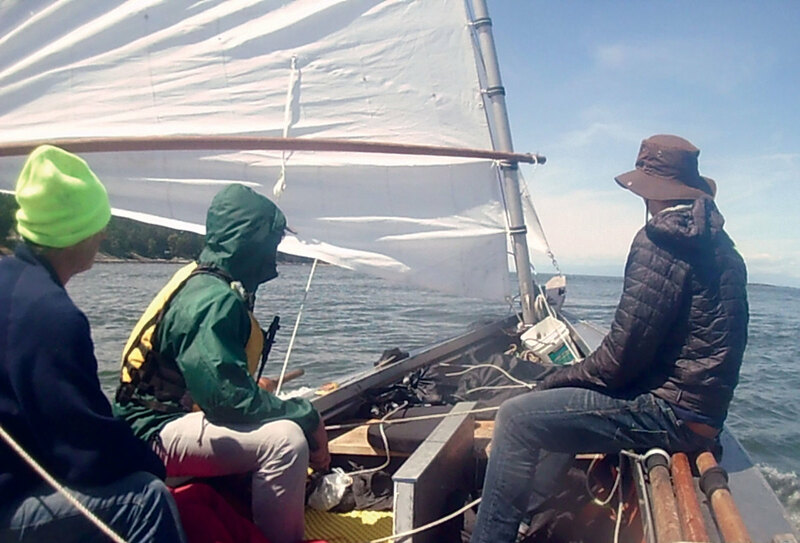 “We’ll do it in 10 days,” they boldly predicted, despite having lost an oar during their shakedown cruise, a sweaty and slow 70-mile round-trip from Anacortes, Washington, and having cracked another oar on the short delivery from Mystery Bay to Port Townsend. Nobody doubted their hustle, strength and desire, or their craft. But knowing the volatility of teenage brains, this question came to mind: When things go sideways, as they inevitably do in this race, will it be because of a temporary lapse of the synapse or because of a rolling blackout of oblivion? And will they listen to Greg’s common-sense counsel? Shortly after 5 a.m. on Thursday, June 8 — a rainy, gray and windless morning — the race got underway. First stage: 40 miles to Victoria Harbor. The first radio call by a competitor on channel 68 came from Greg: “Race committee, race committee, this is North to Alaska. We are returning to Point Hudson because, um, we lost our tracker. Can you issue us another one?” A spin doctor, he is not. ”Everyone was a little miffed,” Henry says. “And I was like, ’Come on, Henry, of all the things!’ ” They got a new device and were back on their way an hour later, rowing hard to the sounds of Johnny Horten. But the calamity of the domino effect crept up on them. Because of the delay, an incoming gale hit them shortly before they made landfall in Victoria. Then the step of the forward mast broke. Then the boat refused to tack. All they could do was drift with the fury until they fetched up on a beach on the western shore of San Juan Island, where they spent the night. Early the next morning, in calmer conditions, they set out again to finish the tune-up leg. At 10:40 a.m. and after a hefty 30-mile detour, they sauntered up to the dock at the Empress Hotel in Victoria. Then Henry and River split to catch the ferry back to the United States, to attend their high school graduation in Port Townsend, while the other three bought bivy sacks and fixed the boat. “Fortunately this happened early, so we had a chance to repair and beef up the mast,” they later said. The challenge also helped them sort out what’s known as crew resource management. They were on a steep learning curve but avoided making the same mistake twice. On the second leg, an arduous 710 miles from Victoria to Alaska, the Johnny Horten went as steady as an aluminum sharpie goes. 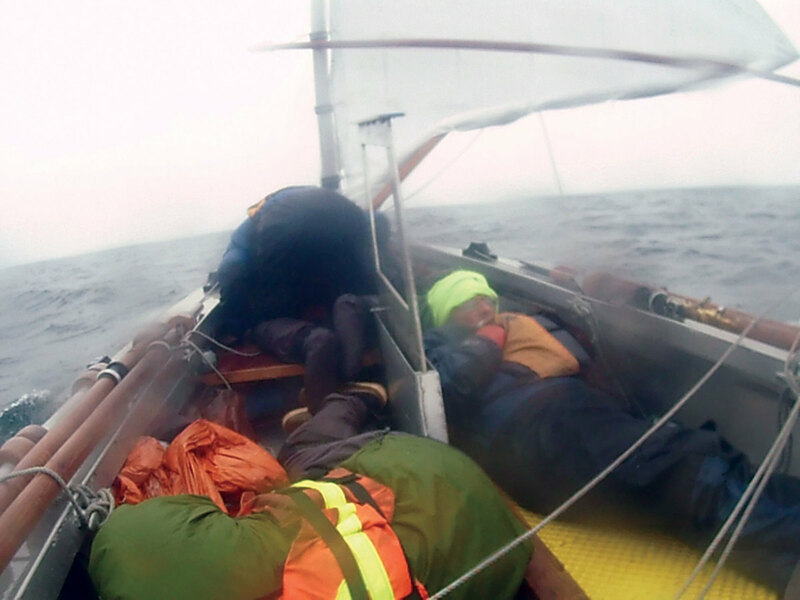 Sometimes they took refuge in safe anchorages to wait out gales, including the east-southeast snorter that roared through Johnstone Strait at 40-plus knots on June 15. 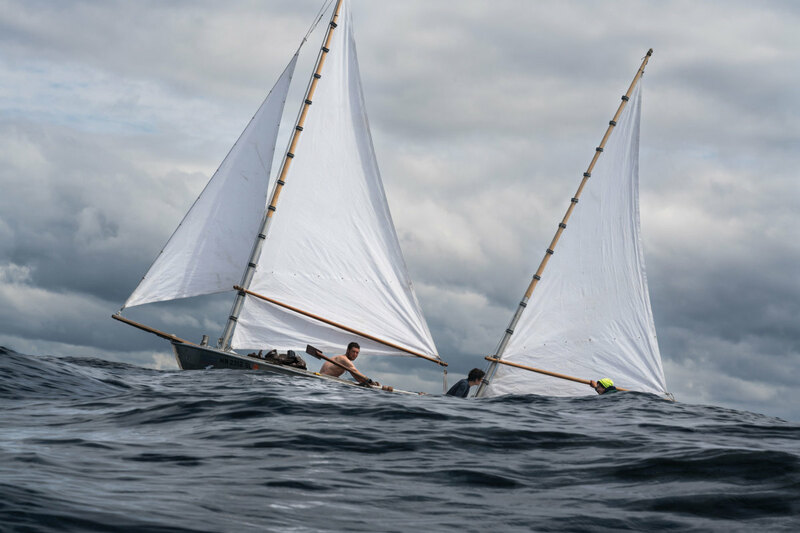 At other times, they skedaddled, aided by a backstay breeze and a friendly tide. They claimed that they got their sharpie up to double digits in surfing passages, and yes, they flirted with capsizing at least once. But they also rowed. A lot. Taking six-hour shifts, two watches split oar duties. Going up-current was hard on hands, backs and morale. “It’s heartbreaking to row for six hours and average 0.5 knots,” Church says. “Roughing it” was a term too noble for their lifestyle. They slept while leaning against the mast. One lucky lad could curl up under a brown plastic tarp in the bow. For Greg, winks were harder to come by because of, well, age and because he froze his rear end off, so he did double duty at the helm. “I hadn’t done a lot of extreme adventuring before, so I was only marginally equipped,” he says with a laugh. “I was in charge of the smart stick [the tiller] while they handled the dumb sticks [the oars].” It’s easy to imagine four pairs of strong arms furiously working before the mast while the elder statesman on the poop deck reminded them to pace themselves. They subsisted on freeze-dried grub — biscuits and gravy took the crown — and meals ready to eat, what army recruits worldwide know as MREs. “They had no fiber content, so it took longer to digest,” Yearian says. “The military doesn’t want people to take a crap, I guess.” That business required some acrobatics on a 25-foot boat. They had a bucket, but nobody wanted to use it, so they went alfresco over the side. 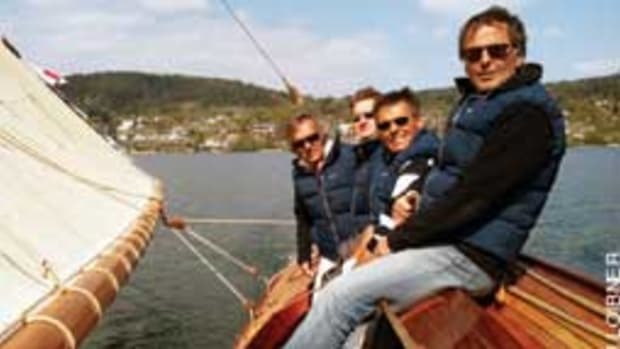 Life without luxury: Stacked with provisions and gear, there wasn’t much room aboard the Johnny Horten for anything other than rowing, sailing, eating and sleeping. 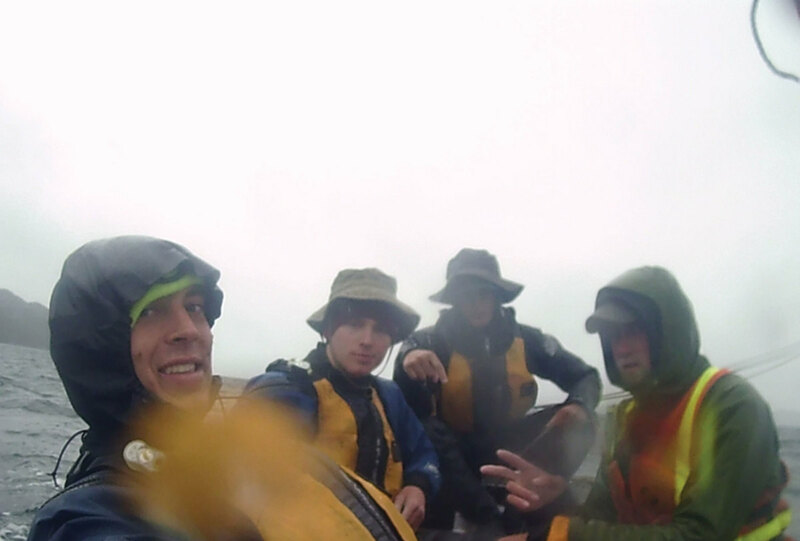 The N2AK crew placed fourth, completing the Race to Alaska in 9 days, 22 hours, 54 minutes. Oh, and the boom box drowned, too. But their theme song did not because, you know, rowing and bel canto is not just for the gondoliers in Venice. Toward the end, the cold got to them, but the wind had mercy, allowing them a quick 200 miles. They rang the ceremonial finish-line bell at the dock in Ketchikan on June 21, 09:54 Alaska Daylight Time, as the 12th boat home, posting a time of 9 days, 22 hours and 54 minutes. 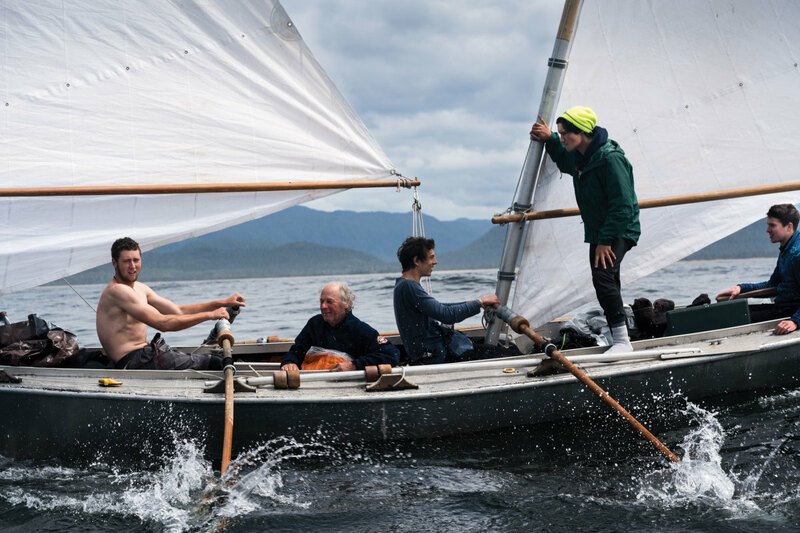 In race parlance, that moment is called “Welcome to Done.” And done they were: beating their own projections, proving scattered skeptics wrong and making Henry the youngest participant to finish this race and the youngest captain to lead a team to Ketchikan. They had crushed it. Greg did have to deal with a personal plumbing issue, but that sorted itself out with the help of some antibiotics. He was proud of and contented with their achievement — and happy to let it stand. It’s the old Woodstock concert lesson: Epic experience does not get better through repetition. He’d gone through the Inside Passage too many times to count, but never on a small, open boat. Exposure made a big difference, he notes, but so did the teamwork. “I’m impressed by how we did it, with 200-year-old technology and without the fancy gizmos,” he says. In his mind, he’d already switched to fishing, which is what they came here for, in case you forgot. First salmon, then halibut. On their seiner Barbra B, and with Henry and Malachi on the crew. To the boys, this ride through the Inside Passage might have felt like a glorified commute, but it was also a passage to adulthood. It was tough, but it could have been harder, was a common sentiment. A few blisters, a few scratches and a sack full of great memories is what they came away with, along with a hunger to do more. A solo effort perhaps, like Roger Mann, the iconic single-hander they encountered at Higgins Pass for a powwow and a meal of shared salmon. Or doing it like Karl Kruger, the first man ever to finish this race on a standup paddleboard. Once they have children of their own, they might remember Shaw’s words and the larger meaning of their graduation trip to Ketchikan. 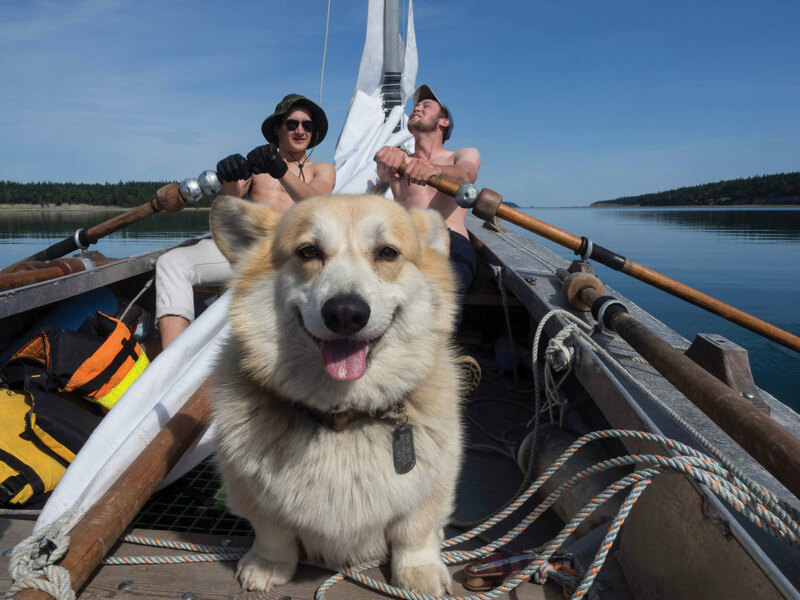 Hopefully they’ll follow Greg’s example by building a boat and doing this race with a new generation of adventurers. Then it will be their turn as elder statesmen on the poop deck to harness the unbridled energy of youth while hogging the smart stick.